Your event has been submitted and is awaiting moderation. This popular event will quiz participants on all things poetry in celebration of National Poetry Month. 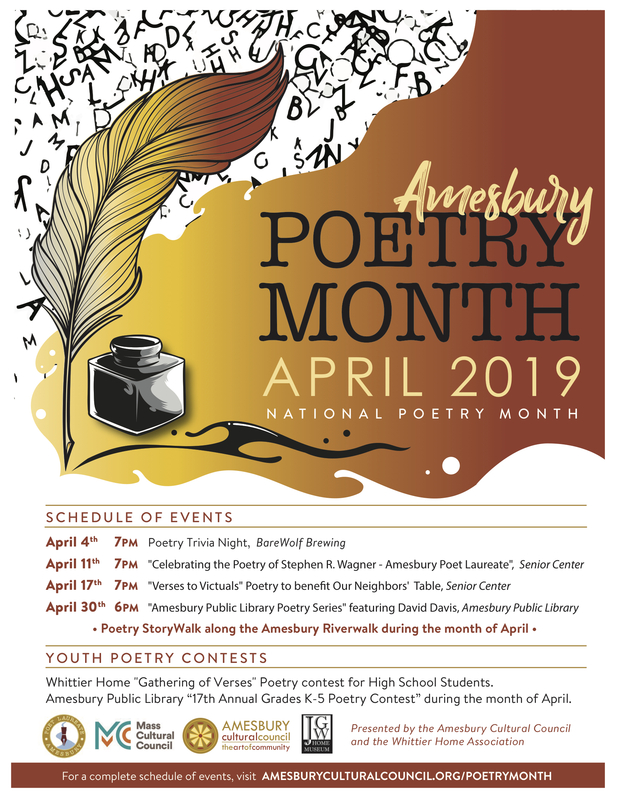 In honor of Amesbury's Poet Laureate, members of the community will read his poems about Amesbury. Also, local poets will read selections from his three collections: Time Sheets I, II, III. Everyone has a relationship with food from enjoyment, to addiction, to avoidance, and to need. This night's poetry will be about food and benefit Our Neighbor's Table. Bring canned food to donate. By request, poet David Davis returns to the Amesbury Public Library with poetry that is both witty and profound. Followed by an open mic. An illustrated story in verse will be installed along the Riverwalk for the month of April. The story is "Jazz Day: The Making of a Famous Photograph," which should appeal to all ages.